Gasoline, which had just been made exclusively unleaded in the U.S. was $1.11/gallon. The Summer Olympics were held in Atlanta GA, and Mohamed Ali lit the opening flame. Over the next 20 years, many things have changed. Gasoline has roller coastered past $4 per gallon. The 'Greatest' has passed on. Starbucks now has 22,500 stores in 70 countries. Minimum wages in some cities are as high as $15/hour and game systems too many to mention, can be ordered by teens directly from their smart phones. 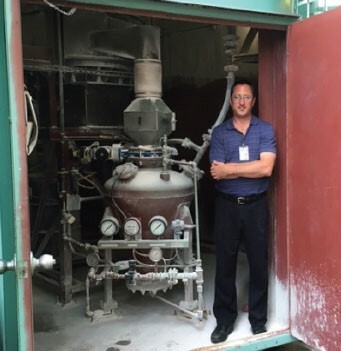 During the same 20 years at S&C Electric, an estimated 40 million pounds of silicon dioxide and aluminum hydroxide have been conveyed from the silos to the injection molding lines without a minute of unscheduled downtime since their original installation. We know that because it almost changed last month. Almost. We received a call from Rich Pokorski, who is now the Manager for the Product Engineering Group in the Polymer Products Department at S&C Electric, to our parts group in Kansas City asking for pricing and availability for a new bypass valve. "I think that one of our DPT's (a.k.a. Dense Phase Transporter) has a malfunctioning bypass valve. It sure looks like we're dumping air into the convey line and bypassing the pot. This is creating very slow transfer rates." 1. During the filling of the vessel with material it opens and vents the displaced air down the convey line. This is a unique feature that eliminates the need for a separate vent line to the top of the silo or a separate dust filter in some other location. This reduces the systems complexity while increasing reliability. 2. The bypass valve accurately controls the product-to-air ratio as the product is discharged from the vessel. This is the main purpose of the bypass valve. It works similarly to a butterfly or knife gate would on the discharge of the pressure vessel, but it does so by controlling the air instead of a physical obstruction to the material flow. When the desired convey pressure is reached, the bypass valve bleeds clean air from the top of the pressure vessel into the convey line downstream of the vessel. And when the pressure in the line downstream is equal to the pressure in the vessel, material flow stops, effectively turning the flow out of the vessel "off". Material already in the line will continue to convey down the line as the pressure behind it rises. Once the pressure in the system falls back below the bypass valve setting, it closes and air resumes going into the vessel, turning the material flow "on" again. This is similar to the process PD trailer or railcar operator's use when unloading, but they do so manually by turning valves. In reality those are just "big pressure vessels on wheels" operating under similar design circumstances, albeit a little more primitively. So, if a bypass valve fails, it would short circuit the vessel by passing most (or all) of the air around the vessel and down the line from the second that the compressed air turned on. When this happens, no pressure can build up in the system and the system will not transfer material. Upon Mr. Pokorski's request, we went to work finding out price and delivery on a new bypass valve. Since a lot of design changes and engineering tweeks can happen in 20 years, we dug into our archives and found the drawings of the equipment originally supplied. Our research showed that the bypass valves that were supplied 20 years ago were our "Generation 2" construction and our current "Generation 3" design is a direct replacement. With confidence we contacted Mr Pokorski with a proposal for price and delivery on a new bypass valve. Three days later we received a call back. To both our pride and our chagrin, Mr. Pokorski informed us that: "We looked at the bypass valve today. It looked pretty good. We did find that somebody turned the bypass pressure regulator down to 7PSIG. We just set it back to 25 PSIG. It's working just fine now"
So it turns out, the more things change, the more they stay the same. To prove it, John Fairbairn took this picture (on his Smart Phone no less) of Rich Pokorski with one of the vessels they collaborated on 20 years ago...that still does not need any replacement parts. For more information on Smoot Dense Phase Systems Click Here.